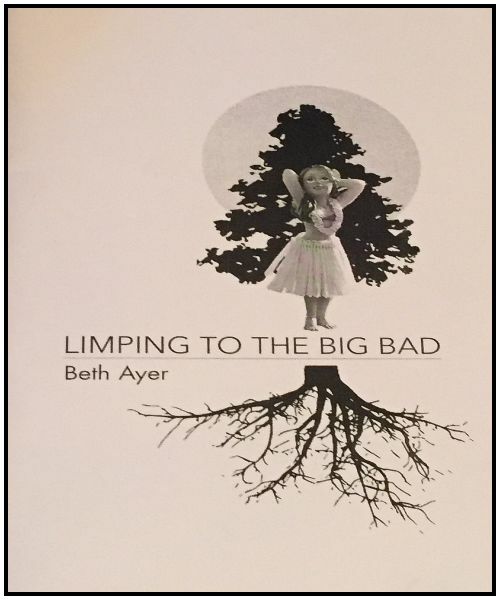 She has a pipeline to the sky"
Limping to the Big Bad by Beth Ayer is an adventure in surrealism, plays with the light, spins reality into fantastical spaces in the New Age Renaissance Republic of Poetry. Beth Ayer (Poet, poetry editor) lives and works in Easthampton, U.S. She has had poetry published in various literary zines, including Sixth Finch, Ocean State Review, Jubilat, Divine Poetry and Apartment Poetry. This poetry is "the ordinary" in everyday life expounded. Pushing the wonder cue with creative wordplay, weaving in and out of reality almost as if creating reality metaphors. There is a certain element of the nonsensical, as if based in DaDa, a series of broken thoughts. In the spin of deconstruction the thoughts are joined, the weave creates a subtle reconstruction that gives a soft feel to perhaps rough terrain. The poetry begins in reality and with a subtle feminine spin begins to wing into exotic realms, out of time, out of mind, surreal and with shots of fantastical humour. the fenestration is purely decorative. at the department of motor vehicles . . ."
Somewhere in a laundry late on a Saturday night watching the clothes go round, gaslighting under street lights, spins. "O' poetry of the beauteous rag" Limping to the Big Bad by Beth Ayer and above/ground press.